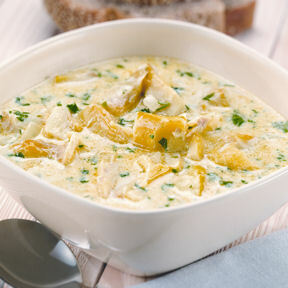 This superb chowder is a popular dish in Scotland, a land of fine produce including Aberdeen Angus beef, Loch Fyne seafood and fantastic single malt scotch whisky. 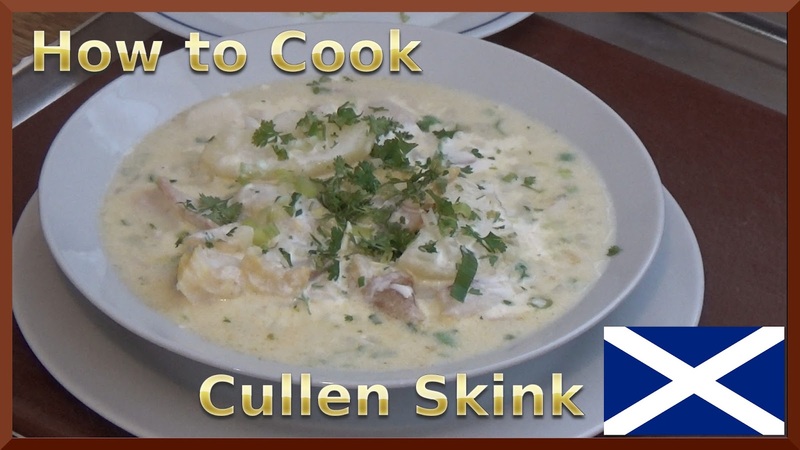 Cullen skink is more substantial than most soups, and it can be served either as a starter or a main. An authentic cullen skink will use finnan haddie, but it may be prepared with any kind of smoked white fish like haddock or cod. Smoked fish is salty enough, so no salt is added beyond that in the fish stock. An alternate garnish is finely chopped spring onions (scallions). Melt the butter in a pan, add the onion and cook gently for 7 - 8 minutes until it is soft but not browned. Pour in the stock and the milk and bring to the boil. Add the sliced potatoes and simmer for 20 minutes until they are really soft. Add the smoked haddock and simmer for 3 - 4 minutes, until it is cooked and will flake easily. Carefully lift the fish out onto a plate and leave to cool slightly. Meanwhile crush some of the cooked potatoes up against the side of the pan with the wooden spoon to thicken the soup a little. When the smoked haddock is cool enough to handle, break the fish into flakes, discarding the skin and any bones. Return to the pan and stir in the parsley and some seasoning to taste. Stir in half the cream, leaving the rest for garnish. Serve garnished with a swirl of cream, a little more chopped parsley and/or chopped spring onions. Serves 4-6 dependent on portion size.